The original soap was made in Windsor, England, and exported around the world. Brown Windsor was said to be a favorite of Napoleon, a notorious lover of scent. In the U.S., the soap was sold from the time of Lewis and Clark through the Civil War and into the Twentieth Century. By now, you must be wondering what it smells like and why it was so popular. Cristiani’s recipe called for lavender, bergamot, caraway, petitgrain, cinnamon, and clove. We tested various proportions of these essential oils and chose the blend we found most satisfying. The spiciness you’ll smell in the bar comes from cinnamon and clove. The sweet citrus scent comes from bergamot, a lemon-like fruit from Italy; the green citrus aroma comes from petitgrain, distilled from the twigs and leaves of bitter orange trees. You’ll love the caraway. This essential oil, prized in perfumery, adds a sophisticated twist. Lavender ties it all together. We add shea butter and avocado oil for extra moisturizing. Like all of our soaps, this a splendid skin care bar. Our Brown Windsor looks like granite—russet brown with flecks of pure white soap. Coffee makes the rich brown color but adds no aroma. 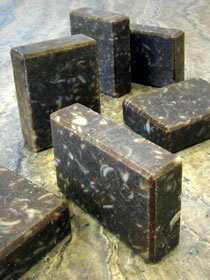 Our Coffee soap is scented entirely differently, with coffee bean extract. Brown Windsor joins our collection of traditional soaps like Old Fashioned Lye, Bay Rum, and Lavender Oatmeal. We are proud that these and many others are sold at National Parks and Historic Sites.